DALLAS, Aug. 2, 2017 /PRNewswire/ -- Texas Instruments (TI) (NASDAQ: TXN) today, opened the door for developers to implement high-performing DLP display technology with virtually any low-cost processor. The new 0.2-inch DLP2000 chipset and $99 DLP® LightCrafter™ Display 2000 evaluation module (EVM) now make it more affordable to leverage DLP technology and design on-demand, free-form display applications such as mobile smart TVs; pico projectors; digital signage; projection displays for smart homes, smartphones and tablets; and control panels and Internet of Things (IoT) display solutions. 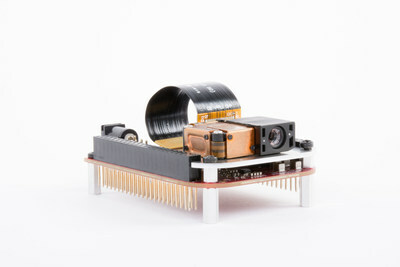 For more information about the DLP2000, see http://www.ti.com/DLP2000. With the DLP LightCrafter Display 2000 EVM, developers worldwide can easily design with DLP technology. The EVM’s dual connector is set up to support any flexible GPIO-driven video interface capable of up to 24-bit red/green/blue (RGB)-capable processor, including the BeagleBone Black development board based on TI Sitara™ AM335x processors, and includes software drivers and BeagleBone Black code examples for easy programming. This makes the technology more accessible for developers to incorporate high-performing DLP Pico™ displays into new applications. Industry’s most affordable pico display solution: Designed with developers in mind, this $99 EVM is a building block to pair with low-cost processors for display applications. Virtually limitless display possibilities: The 0.2-inch diagonal display is based on the smallest DLP Products digital micromirror device (DMD), designed for compact, space-constrained display applications. Developer-friendly: The new EVM features a standard interface and plug-and-play functionality for quick assessment, allowing signals from the display controller to connect with any 24-bit RGB-capable processor and providing solutions with a high-definition (HD) aspect ratio. Compatible with low-cost processors: Inclusive software drivers and BeagleBone Black code examples ease the programming process. The DLP2000 is available now for US$19.99 and the DLP LightCrafter Display 2000 EVM is available for US$99.00 through the TI store and authorized distributors. For more information, see www.ti.com/dlp2000 or watch the DLP LightCrafter Display 2000 demo to see how quickly you can get started. Download the DLP2000 chipset datasheet. Get started with DLP Pico technology. Download the DLP2000 reference design. Since 1996, award-winning TI DLP technology has powered the world’s top display devices to deliver high-resolution images rich with color, contrast, clarity and brightness for a wide range of applications, including industrial, automotive, medical and consumer market segments. DLP technology is being used in movie theatres (DLP Cinema® products) and large-scale, professional venues and conference rooms, classrooms and home theaters. With mobile devices enabled by DLP Pico technology, users have the ability to display images from the palm of their hand. Every DLP chipset features an array of microscopic mirrors that switch on and off up to 10,000 times per second. To learn more, please visit www.ti.com/dlp or follow TI DLP technology on Twitter at @TI_DLP. Texas Instruments (TI) is a global semiconductor design and manufacturing company that develops analog integrated circuits (ICs) and embedded processors. By employing the world’s brightest minds, TI creates innovations that shape the future of technology. TI is helping more than 100,000 customers transform the future, today. Learn more at www.ti.com. DLP and DLP Cinema are registered trademarks and Pico and LightCrafter are trademarks of Texas Instruments. All registered trademarks and other trademarks belong to their respective owners.